As pointed out in our previous blog, the Cloud Volumes Service for GCP service provides application owners and DevOps engineers a no-ops file service to move Unix/Linux and Windows applications to GCP. The easy part is getting a Cloud Volume provisioned in a project within a few seconds to provide a NFS or SMB endpoint. The harder part is answering the next question: How do I move the data associated with my app to Cloud Volumes? If you want to cut to the chase: The answer is Cloud Sync - watch this demo video. For the more patient, continue reading. Now there is a cloud service alternative that you can just use online without having to download and install any software. NetApp’s Cloud Sync service provides a way to move data to Cloud Volumes for GCP that is efficient, simple, flexible and reliable. Quick and Efficient - Continuous, automated data synchronization. Cloud Sync provides extremely fast data movement compared to other synchronizing solutions. Safe and Secure - Delivery assurance based on built-in data protection. Secure data storage and transport with support for VPN and VPC. Cost Effective - Flexible on-demand consumption. Purchase directly or from the AWS marketplace licensed or pay-as-you-go model. 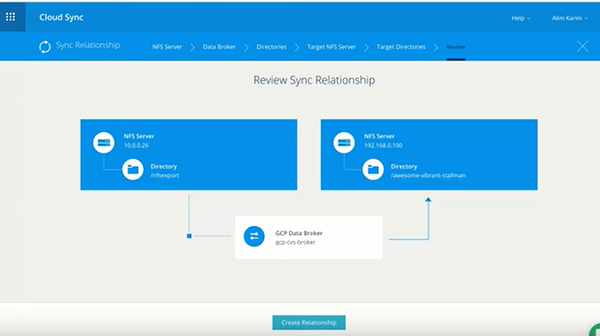 Sync Hybrid Data Environment - Bring your data center and the cloud together. Realize the power of the Data Fabric with the ability to get your data where you want, when you want, and in any format. Intuitive and Easy to Use - Simple user interface and monitoring tools. Automate complex data migration processes by using a simple drag-and-drop wizard and monitor progress with designated tracking tools. 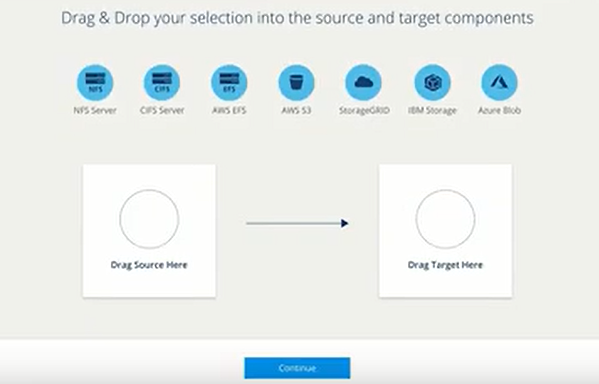 As we demonstrate in this short video, you can use Cloud Sync to move your application data into your newly provisioned Cloud Volume on GCP, with the benefits outlined above. Several Cloud Volumes for GCP customers are using Cloud Sync to migrate their application data to GCP and are extremely happy with the simplicity, efficiency and reliability it provides them. Ultimately Cloud Sync with Cloud Volumes for GCP enables these customers to complete their application transitions faster with lower risk. To sign up for Cloud Volumes please click here. Moving workloads to the cloud can help you accelerate delivery of new and innovative technologies and services. Done correctly, it can help increase your business flexibility, increase application performance, and enable you to leverage analytics and other cloud services. Done poorly, it can increase application latency, add additional support costs and processes, and potentially cause data loss and security issues. This is especially true when migrating existing on-premise workloads to the cloud and operating in a hybrid environment. NetApp Cloud Sync Service is software-as-a-service (SaaS) that enables you to transfer and synchronize data between your on-premise data center and GCP, and between different NetApp Cloud Volumes on GCP. NetApp Cloud Sync supports NFS servers, CIFS servers, and S3 Buckets. Once data is transferred, it is fully available for use. 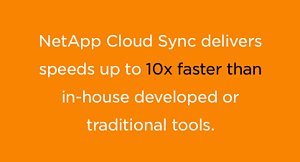 NetApp Cloud Sync transfers data in parallel processes delivering speeds up to 10x faster than in-house developed or traditional tools (such as rsync or Robocopy). Data synchronization is also faster as only data that has changed is updated. As NetApp Cloud Sync is a service-based solution, there is no need to write scripts, maintain changes, update versions, or handle compatibility issues. It is truly a no-ops solution. NetApp Cloud Sync used with NetApp Cloud Volumes for GCP makes it easy for you to transfer workloads to the cloud at your own pace. You can move workloads where it makes sense while maintaining compatibility between databases on-premise and in the cloud. 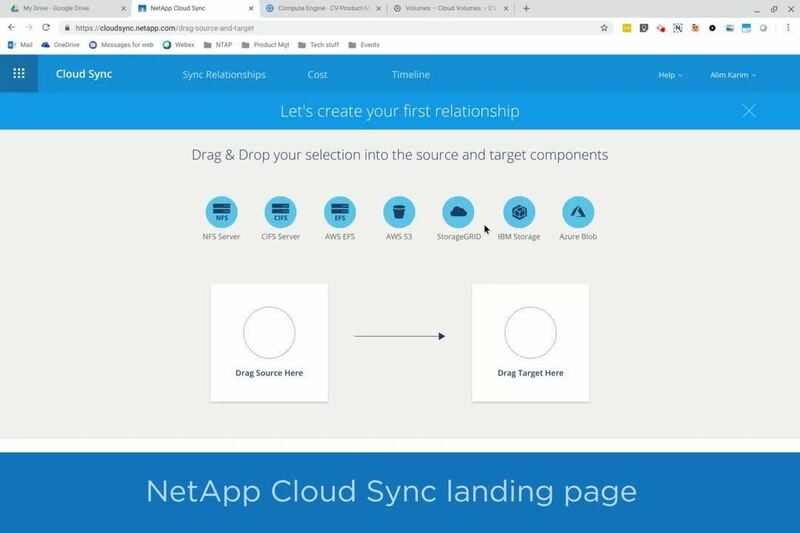 The NetApp Cloud Sync Service utilizes a Cloud Sync Data Broker to manage the transfer of workloads between an on-premise environment and a NetApp Cloud Volume on GCP. The transfer is orchestrated through https://cloud.netapp.com, or a native GCP UI for provisioning and management of Cloud Volumes Service, making it similar to other native GCP resources. A typical data transfer topology is shown in the diagram below. In this case, a NFS server is to be connected to a NetApp Cloud Volume on GCP. 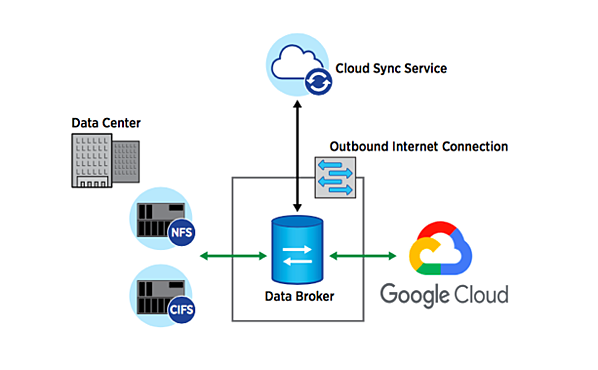 The NetApp Cloud Sync Data Broker manages the movement of data between the on-premise NFS server and the NetApp Cloud Volume on GCP. The Cloud Sync Manager simplifies the entire setup procedure by using a drag and drop process. In the first step, the server type is dragged to the source and target. The next steps involve identifying the source and target volumes, and specifying the Cloud Sync Data Broker. Once fully defined, the topology map is populated with the correct server and directory addresses. Clicking on the “Create Relationships” button starts the transfer. Confirmation of the transfer can be made by looking at the Cloud Sync Service dashboard, or checking the directories in the source and destination folders. NetApp Cloud Sync used with NetApp Cloud Volumes for GCP is designed to be a no-ops service that delivers easy to consume NFS, SMB, and S3 endpoints. Application owners and DevOps engineers can simply provision and consume these endpoints without worrying about infrastructure setup and management. NetApp Cloud Volumes delivers a native GCP UI for provisioning and management of Cloud Volumes Service. Both the allocated capacity and service level for volumes can be increased or decreased as needed. Billing is simple and integrated with GCP, and GCP provides level 1 support for this service. Watch this demo video to see the native service experience in action. Get exclusive access to NetApp Cloud Volumes for Google Cloud.